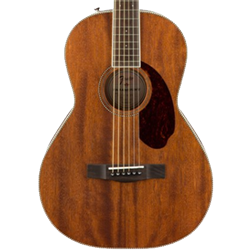 Case - Deluxe Black Hardshell (Black Interior) Included EARTHY AND ORGANIC An expansion of the Paramount Series acoustic guitars, the PM-2 Parlor NE, All-Mahogany, Natural combines simple styling with an organic finish to create a highly responsive instrument. Carefully crafted for superior tone, high performance and earthy visual appeal, this premium instrument will satisfy all players searching for an inspiring guitar. FEATURES Open-pore mahogany top with scalloped “X”-bracing Solid mahogany back and sides BODY Body Back Solid Mahogany Body Sides Solid Mahogany Body Top Solid Mahogany Body Finish Open Pore Body Shape Parlor Body Binding Aged White, Black, Checker, Black Bracing Quartersawn Scalloped "X" Rosette Fender '60s Checkerboard NECK Neck Material Mahogany Neck Binding 3-Ply W/B/W Neck Finish Open Pore Satin Urethane Scale Length 24.75" (629 mm) Fingerboard Material Rosewood Fingerboard Radius 15.75" (400 mm) Number of Frets 20 Fret Size Vintage Style Nut Material Bone Nut Width 1.75" (44.45 mm) Position Inlays Mother-of-Pearl Truss Rod Dual-Action HARDWARE Bridge Ovangkol Bridge Pins Ebony with Mother-of-Pearl Dots Hardware Finish Nickel Tuning Machines Nickel Open-Back Pickguard 1-Ply Tortoiseshell MISCELLANEOUS Strings Fender® Dura-Tone® Coated 80/20 Bronze (.012-.052 Gauge) Other Features Modified Fender Traditional Bridge, Factory-Mounted Forward Strap Button with Internal Block Reinforcement, Bound Fingerboard, Bone Nut and Saddle Legal Notice WARNING: Cancer and Reproductive Harm - www.P65Warnings.ca.gov.